It’s Friday! It’s Random! It’s Halloween! Here we go…. 1. I don’t know about you but Halloween was one cool night when I was a kid. Having it land on a Friday was like a gift from above. A Friday vs. a school night meant one or two extra stops and no strict bedtime ~ that gave us more time to check for razors in apples (never happened) and inventory the goodies in our bags. Yippee skippy! 2. I was a complete tomboy as a kid. Sporting a rats’ nest of curls, jeans and a hoodie, I just couldn’t be bothered with dresses and all that stuff. When you’re busy riding your pony and picturing yourself as some kind of “Billy Jack” outlaw, dresses just get in the way. So it made perfect sense when Mom bought me a Princess costume and mask. 3. 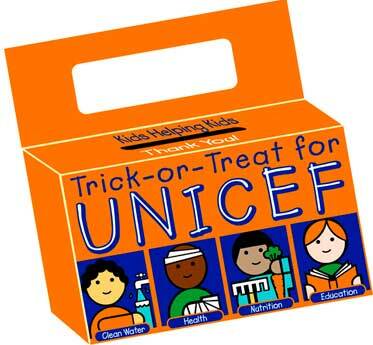 At school we had to go around town and collect money for Unicef. This was done before the hot dogs and the games and treats and the candy toss. I’m pretty sure that, between the 8 of us in my grade, we collected about $1.49. 4. Our forecast is for 40 F temps and a sustained wind of 45 mph. 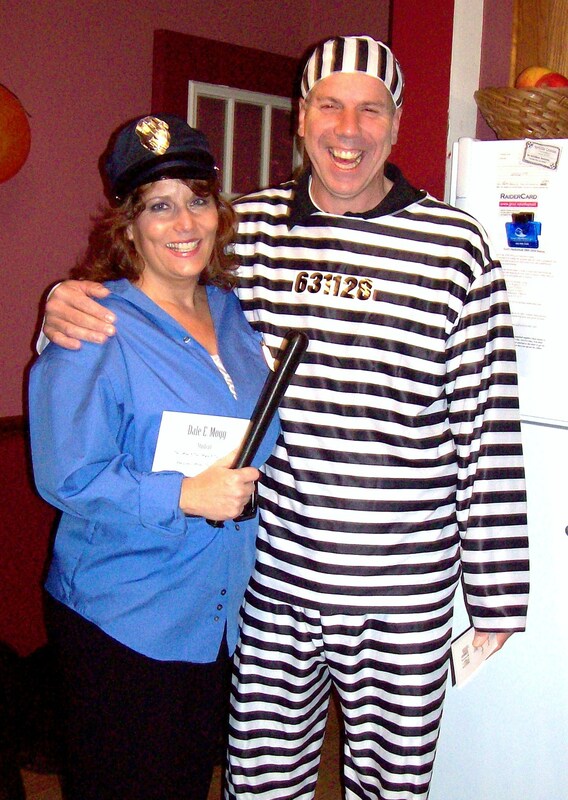 We’ve been to lots of Halloween parties over the years and, now that I think of it, it’s always been cold … but that has yet to damper our fun. 5. Remember me fretting about giving a speech before 450+ people the other day? I was nervous and woke up with a swirly stomach feeling. I had a little chat with myself and the gist of it was that I know what I’m talking about and, on the topic in question, more than anybody in the room. And you know what? I nailed it! That feeling of accomplishment lingers with me still. Whew! 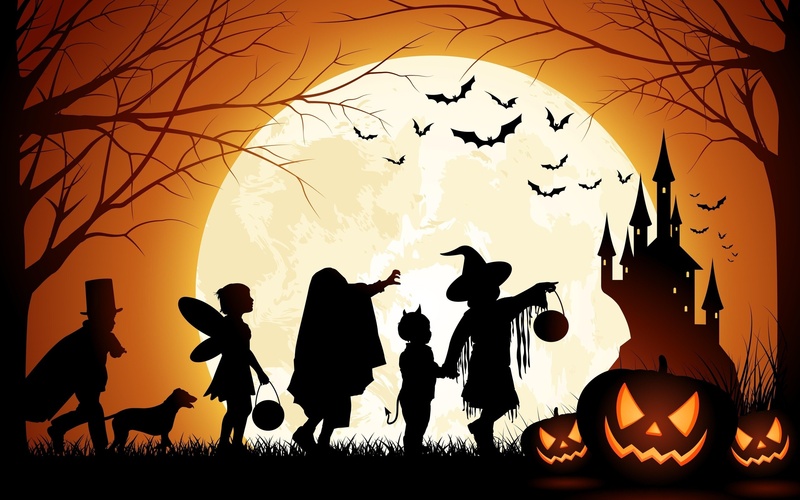 So .. do tell .. what were your Halloween traditions? Do you still celebrate Halloween? I still miss singing for our treats and receiving home-made caramel apples & goofballs. Cute picture of you and hubby! As I mentioned in a comment on another blog this morning, I only went trick-or-treating once. We lived in a very rural area, so it just wasn’t done. But I do recall my mom making homemade fudge for the trick-or-treaters and putting it in little baggies (before Ziplocks). So sad that our world isn’t as simple and kind and SAFE as it was then. We all knew you’d nail that speech…! I am very glad to have that speech behind me ~ and yes, I miss the days of home-made treats in ziplocks or waxed paper, too!! Happy Halloween! As Dianna said, “We all knew you’d nail that speech…!” Go girl. Have a wonderful weekend. I know you’re glad it’s over…everything goes on “hold” until such things are gone, bye-bye, history., behind us.” I’m breathing a “whew” with you. Daughter has programmed three addresses in her gps tonight for grandson to trick or treat. 3 cousins , my cousins’ children, in the neighborhood. So glad she’s back home where there’s family. Of course you nailed it. We weren’t worried so why were you? Having dinner with friends tonight but one of our most fun costumes was when my husband and I went as matching nuns to a party. Drivers are much more polite to nuns driving cars. It was hilarious. Congratulations on nailing your speech! I love your Halloween memories and all the fun parties. My Halloweens pale by comparison – – sweet costumes in a quiet, safe neighborhood. At first my Mom would create little packages of loose candies (variety packs) for the trick or treaters, but later we were not allowed to devour anything that wasn’t wrapped in its original sealed wrapper. I remember those Halloween goodie bags like your Mom created — wonderful! I didn’t have any doubts that you’d do well, you’re the “Triple Threat” MJ. #1…You know your subject very well. Ha ha – RR – you are far too kind. Thank you for the support and sweet words. Hey, congratulations on a great job! Couldn’t happen to a more deserving person! We didn’t get any trick-or-treaters here – the weather was miserable – we left the house around 6:30 to meet friends for dinner so maybe some came after that. Good job on the speech, MJ! The neighborhood moms walked with the kids and chatted down our street for trick-or-treat, and only to certain houses of people we knew. It was always chilly, except for behind the sweaty mask. It was fun to pour the candy/apples out of our bags when we got home to explore our treasure. Cute costume photo of you two. Couldn’t get my hubby to dress up. I didn’t have a pony (every kid wanted one, though) but I spent many summer days climbing the big, old apple trees with my Nancy Drew mystery in tow. Oh you must write about climbing trees with your Nancy Drew mystery in tow – that evokes such an image to me! It was fun, as a parent, to live in a neighborhood and go door-to-door. I had as much fun as the kids did! 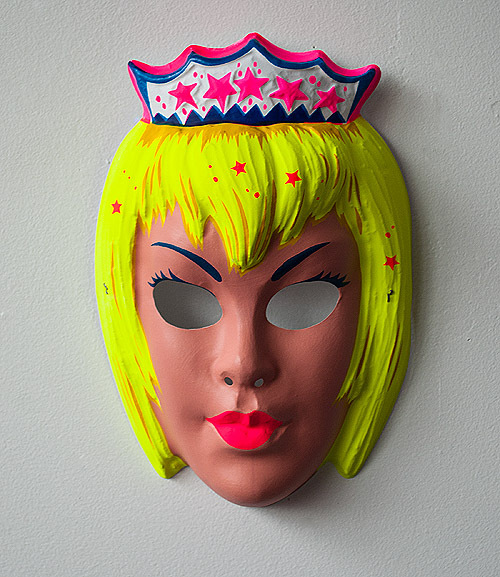 I remember those plastic masks! Mine was a witch mask. I think my sister had the princess. I remember being so very excited for trick-or-treating. What a special day that always was! Mom never allowed us to use pillow cases like so many other kids did. We had big, orange plastic pumpkin buckets to collect our treats. Way to go on your speaking engagement! I wondered if you’d be nervous. So glad to hear you nailed it! I remember the witch mask, I think it was green with a long pointy chin, yes? Thank you for your kind thoughts. I was nervous but woke up that morning and had a little chat with myself – and that worked – whee! !